Jackson Nathaniel “Jax” Teller is a fictional character and the protagonist on the TV series Sons of Anarchy, played by British actor Charlie Hunnam. 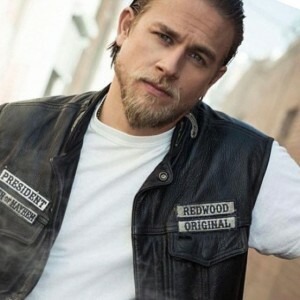 Charles Matthew “Charlie” Hunnam (born 10 April 1980) is an English actor and screenwriter. He is known for his roles as Nathan Maloney in the Channel 4 drama Queer as Folk (1999), Lloyd Haythe in the Fox comedy series Undeclared (2001), Pete Dunham in the film Green Street (2005), Jackson “Jax” Teller in the FX series Sons of Anarchy, and Raleigh Becket in the film Pacific Rim (2013). Jax teller is the President of the Sons of Anarchy Motorcycle Club's Redwood Original (SAMCRO) chapter based in Charming, California. Because he is the President of the founding chapter of the outlaw motorcycle club, that makes him the National President. Until the end of season four, he was the Vice President of the club. He has a number of tattoos, most notably his club's logo on his back, a tribute to his father John Teller on his right arm, his son Abel's name on his chest, and his second son, also the name of his deceased brother, Thomas on his left arm. On his cut, he wears patches reading “President”, “Men of Mayhem”, and a memorial patch for Opie. The motorcycle that he rides is a Harley-Davidson Dyna-Glide, specifically a Super Glide Sport. Jackson “Jax” Teller is the son of Gemma and John Teller and was born in 1978, and raised in Charming, California. His father died in 1993 and his mother re-married Clay Morrow, who then became President of the Sons of Anarchy Motorcycle Club. He lives with the genetic heart disorder (“family flaw” as Gemma calls it) that his brother Thomas “Tommy” Teller (January 8, 1984 – April 4, 1990) died from at the age of six. He carries a USMC KA-BAR fighting knife on his waistband, possibly his father's service knife. At the beginning of the series, Jax serves as the club's Vice President, and works as a mechanic at Teller-Morrow Automotive Repair. He has served time in prison for smuggling and gun-running. His last arrest was in 2012. He married Wendy Case, but filed for divorce because of her drug habit. After Wendy got clean, they reconciled and conceived a son, Abel. Overwhelmed by the idea of being a father and tired of fighting with Wendy, Jax leaves his pregnant wife, allowing her to continue to live in his home while he moved into the clubhouse. Left on her own, Wendy begins using again and winds up overdosing. Abel was born 10 weeks premature and addicted to crank in the pilot episode. In season 5, Jax married his high-school sweetheart and the love of his life Tara Knowles and who is mother of his second son, Thomas. Having discovered several of his father's old journals and an old manuscript titled The Life and Death of Sam Crow: How the Sons of Anarchy Lost Their Way, which collectively lay out the original manifesto for SAMCRO, he finds himself doubting the club's direction, causing friction between himself and his stepfather Clay, and spreading doubt amongst the other members.